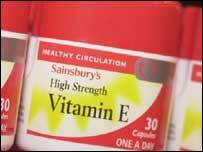 Elderly people could be risking their lives if they take even moderately high doses of vitamin E, evidence suggests. The latest study by Johns Hopkins University found people who took even half of the recommended current maximum dose had an increased risk of death. The authors told the American Heart Association meeting that policy makers should consider lowering the upper safety limit. Experts said eating healthily remained the best way to get vital nutrients. But critics said the findings could be biased because although there are many types of vitamin E that come in tablet form studies, such as this one, tended to focus on synthetic rather than natural vitamin E.
The current study's authors acknowledged that because most of the people involved in the trial were aged 60 and older and had conditions such as heart disease, the findings might not apply to young healthy adults. Previous studies have suggested high dose vitamins, including vitamin E, can do more harm than good. The Johns Hopkins team looked at 19 studies carried out between 1993 and 2004 involving more than 136,000 people. Nine of the studies looked at vitamin E alone and 10 looked at vitamin E in combination with other vitamin supplements. All compared vitamin use against dummy drugs. People who took daily vitamin E doses exceeding 400 "international units" (IU) per day (equivalent to about 270mg) had an increased risk of death by about 10% compared with those who did not. In the UK, the Food Standards Agency recommends a daily intake of between 3-4mg or 4.5-6 IU. It sets an upper safety limit of 540mg (800 IU) per day, which is twice as high as the level found to be harmful in the study. In the US, the safety limit is as high as 1,000mg or 1,500 IU per day. Vitamin tablets can provide doses of 200-400mg (300-600 IU) per day. Lead author Dr Edgar Miller said: "If people are taking a multivitamin, they should make sure it contains no more than a low dose of vitamin E.
"Our study shows that use of high-dose vitamin E supplements certainly did not prolong life, but was associated with a higher risk of death." Their research is due to be published in Annals of Internal Medicine. Vitamin E supplements have been shown to protect against cardiovascular disease and cancer. In the study, there was no increased risk of death with doses of 200 IU (133mg) per day or less, and there was evidence to suggest these doses might be of some benefit. Dr Miller said: "The big questions that need to be answered are - what is the dose and how low a dose, in what combination, would be most useful?" The researchers said policy makers should consider lowering the maximum dose to 400 IU (about 266mg) per day. Vitamin E, like vitamins A, D and K, is fat soluble. These are thought to be more risky in higher doses because, unlike very large doses of water-soluble vitamins which can simply be washed out in the urine, these stay in the body and can be toxic. A spokeswoman from the Food Standards Agency echoed this advice and said: "We will look at the evidence and see if we need to revise our recommendations." Dr Robert Verkerk, executive director of the Alliance for Natural Health, said: "Negative publicity about vitamin E, which is likely to follow as a result of misinterpretations over the science behind the Johns Hopkins study, could scare people unnecessarily and stop them using important food supplements." Dr Richard Siow, a lecturer in the cardiovascular division at King's College London. said: "The medical community and the public should treat these findings with a degree of caution since this analysis combines the results from a very broad spectrum of epidemiological studies carried out over 38 years, utilising doses of vitamin E supplementation between 16.5 to 2000 IU per day." Vitamin E is found in nuts, seeds, green leafy vegetables and vegetable oils.